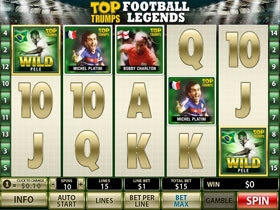 Playtech's Top Trumps Football Legends has many famous stars, past and present, included in this exciting video slot game which is based on the popular card game "Top Trumps." Across the reels you will meet icons such as Pele, Bobby Charlton, Johan Cruyff, Frans Beckenbauer or Michael Platini and the graphics supporting the game are first class quality. The Wild is Pele substituting for all other symbols except the Scatter and The Bonus. There is a coin spread ranging from $0.01 up to $10.00 and spin 5 Wilds with the maximum bet and you win the top Jackpot of 10,000 coins. There are of course many other winning combinations, for example three or more of the Scatter and you win 10 Free Spins. A unique feature is that during the Free Spins an extra Wild is added. The extra Wild is a player of your choice, selected from the Wall of Fame. If you spin a winning line your payout has a multiple of 4x.The Scatter is the Top Trumps symbol and should you trigger three or more scatters during your Free Spins the Free Spins are again available. 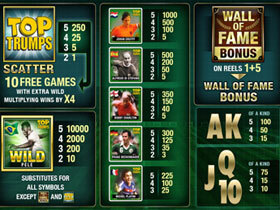 The Bonus Game is the Wall of Fame which displays sixteen football legends when you spin the Wall of Fame symbols on reels one and five. From the sixteen face down cards, which are all face down, you must select three to see how much your rewards are worth. The game will have a definite appeal for all football fans and the fantastic sound effects will certainly strike up some great memories. All this and some good pay outs will ensure an exciting experience.